If you want to get really steamed up about the collusion between your Registrar and Acton-Agua Dulce Unified Schools to lie and cheat in order to steal your taxes, you can read the letter for yourself. Do you want to give this district a Thanksgiving surprise? Please call or text me (with #HonestBalllots, Los Angeles, 0600001, and your name) at 909-378-5401 right now for details. It's urgent and very time-sensitive. This campaign was designed by Caldwell Flores Winters Inc (Emilio A Flores). We figured out just the right words to get you to you to open up your checkbook. To relieve student overcrowding and improve the education environment; renovate and/or modernize Acton, Agua-Dulce, Meadowlark and High Desert; finish Vasquez construction projects; provide 21st century learning technology; and to strengthen campus security, shall the Acton-Agua Dulce Unified School District issue $7,500,000 of bonds at legal rates, repayment averaging $523,000 annually while bonds are outstanding, at a rate of approximately $14.70 per $100,000 of assessed value, with annual audits plus independent citizens' oversight committee and NO money for administrator salaries? Approval of Measure CK ("Measure") would authorize the Board of Trustees ("Board") of the Acton-Agua Dulce Unified School District ("District"), which placed the Measure on the ballot by Resolution No. 17-18.30, to issue general obligation bonds in an amount not to exceed $7,500,000. Proceeds from the sale of bonds authorized by the Measure shall be used only for the purposes specified in the Measure, including but not limited to, making health, safety, security, and accessibility improvements required by law; renovating classrooms, restrooms, and other school facilities, including painting and replacing furnishings and equipment; upgrading electrical systems and lighting; repairing or replacing heating, ventilation, and air-conditioning systems; repairing or replacing roofs; upgrading technology infrastructure; constructing and/or upgrading athletic facilities; replacing and upgrading plumbing, septic, sewer, and utility systems; removing hazardous materials; repairing and/or replacing paved surfaces, turf, playgrounds, and playground equipment; upgrading parking lots, roadways, walkways, and landscape and irrigation systems. Bond proceeds may not be expended on teacher or administrator salaries or other operating expenses. The Board shall cause independent performance and financial audits to be conducted annually to ensure that bond proceeds are spent only for projects identified in the Measure. The Board shall appoint an independent Citizens' Oversight Committee under Education Code section 15278 et seq., no later than 60 days after the Board enters the election results in its minutes, to ensure that bond proceeds are spent as specified in the Measure and as provided by law. The Board shall deposit bond proceeds in a special account and comply with statutory reporting requirements. Bonds shall be issued under Education Code section 15264 et seq., Government Code section 53506 et seq., and/or any other legal provision. The bonds shall not exceed the maximum interest rate or maturity as allowed by law. According to the District's Tax Rate Statement, the best estimate of the average annual tax rate required to fund the bonds, based on assessed valuations available when the District filed the statement, is $14.70 per $100,000 of assessed valuation. The best estimate of the highest tax rate required to fund the bonds is the same as the average tax rate. The first fiscal year the rate will be levied is estimated to be 2019-20, and the final fiscal year the tax is estimated to be collected is 2048-49. The estimated total debt service required to be repaid if all bonds are issued and sold is $15.7 million, including principal and interest. Estimated tax rates are based on the assessed value of taxable property on official tax rolls, not on a property's market value. As residents of Acton and Agua Dulce, we are fortunate to live in a great community and an area that is a good place to raise children. Our schools play an important role in the desirability of our community and help to improve our property values. One of the most important legacies we can give our children and grandchildren are quality schools and a good education. Good schools provide the academic foundation to prepare our students for college, good paying jobs and careers upon graduation. The District has done a good job of building our newest schools with a combination of community support and State grants. However our older schools were built over 50 years ago, and no longer meet modern building and educational requirements. They require a reinvestment by our community to provide our students the facilities needed to compete with similar nearby communities. Measure CK, in combination with anticipated matching State grants will provide the funding required to meet these needs. Vote YES on Measure CK. It's an investment in our children, and will help to maintain the desirability of our community. Please join us in voting YES on Measure CK. District trustees approved a misleading and non-compliant ballot question! Consultants who wrote the ballot question want to deceive the voters. The project list is not specific, strategy is confusing. Maximum interest rate and bond duration is not disclosed. Why not? The payment rate of $14.70 is not guaranteed and cannot be trusted. Bond repayment is $15,700,000. Generational debt deserves careful consideration by the taxpayers. No Mello-Roos. AADUSD is not overcrowded; the student population has been declining for years. The average class size is below the state and county average. Agua Dulce: (occupied by charter school): GoodActon: student enrollment does not justify reopening a school closed years ago. The district and school bond cartel want to guilt you into approving more debt. Do Not Be Fooled! Governor will not authorize approved borrowing to provide matching funds. When voters approve bond funds locally, the state does not need to provide facility funds. California should meet its obligation to support school facilities instead of high speed rail. Measure CK is a blank check with no accountability. Independent audits and citizen oversight committees have NO say whether expenditures are necessary, wise and prudent. It makes no sense to purchase "21st century learning technology "with thirty year bonds. Be a good steward. Voters deserve the whole truth from district officials. Demand transparency. 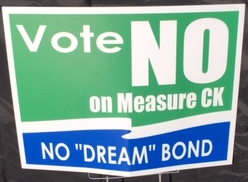 Vote NO on Measure CK! WARNING, the deceptive language in the ballot question is not binding on the district trustees. Do not approve the BOND TAX ! The bond resolution contains a laundry list of possible projects. There is no priority. Specificity is a requirement of the California Constitution. Seniors, veterans, and low income residents are not exempt. The funds are not protected from going to approved charter schools. Measure CF 2008 authorized $13,000,000 and estimated tax rate of $25 per $100,000 assessed value. The 2017 audit discloses balance of $15,973,904 and tax rate of $31. Surprise! The bond repayment schedule even escalates in future years. That is not what voters approved. Did the bond oversight committee report this to the district? Why aren't the oversight committee reports available on the web? Measure CF promised $9,500,000 in state matching funds. What happened to that money? State matching funds are not available. The proposed bond issue of $7,500,000 estimates tax rate of $14.70 totaling $15,700,000 until years 2048-49. Read the tax rate statement. This is debt layered on top of debt. Do not be fooled! Why don't they disclose the bond's maximum interest rate and duration? You would never sign a mortgage with shoddy disclosure! The trustees and bond lawyers must be held accountable by voters. The promise of "independent" oversight committees is pretty wallpaper meant to influence your vote. The committee is not independent. Members are selected by the trustees, have no budget, and are used to rubber stamp the auditor's report. "No money for administrator salaries", a complete deception. Administrators can be paid from bond funds. The district lawyers know this assertion is false. The District remains committed to providing a quality education and facilities that meet student needs. However, our older schools were built over 50 years ago and no longer meet modern building and educational requirements, additional improvements are needed. Measure "CK" will improve student safety at all schools and upgrade the Acton campus to reduce District overcrowding. This investment will modernize and repair classrooms at Meadowlark, Agua-Dulce, and High Desert to ensure our students have the schools they deserve. The District delivered what it promised to voters during the last bond election: the construction of a new high school. At that time, the District estimated it would receive $9,500,000 in State matching funds but actually received $14,400,000, which provided more funding to build the new Vasquez High School. Measure "CK" will again make the District eligible to receive additional State grants for both the modernization and new construction of school facilities. By law, an independent financial and performance audit must be completed every year for all Measure "CK" expenditures, and a citizens' oversight committee including a taxpayer organization representative must review all expenses. It is never a good time to wait to improve our schools. Good schools attract good families, businesses, and investment. Please vote YES on Measure "CK"! To relieve student overcrowding and improve the education environment; renovate and/or modernize Acton, Agua-Dulce, Meadowlark and High Desert; finish Vasquez construction projects; provide 21St century learning technology; and to strengthen campus security, shall the Acton-Agua Dulce Unified School District issue $7,500,000 of bonds at legal rates, repayment averaging $523,000 annually while bonds are outstanding, at a rate of approximately $14.70 per $100,000 of assessed value, with annual audits plus independent citizens' oversight committee and NO money for administrator salaries?" By approval of this measure by at least 55% of the registered voters voting on the measure, the District will be authorized to issue and sell bonds of up to $7.5 million in aggregate principal amount at interest rates not to exceed legal limits and to provide financing for the specific types of school facilities projects listed in the Bond Project List included below, subject to all the accountability requirements specified below. Evaluation of Needs. The Board of Trustees of the District has identified detailed facilities needs of the District and has determined which projects to finance from a local bond. The Board of Trustees hereby certifies that it has evaluated safety, class size reduction, enrollment growth, and information technology needs in developing the Bond Project List included below. Independent Citizens' Oversight Committee. Following approval of this measure, the Board of Trustees will establish an independent citizens' oversight committee, under California Education Code Sections 15278 and following, to ensure bond proceeds are expended only on the types of school facilities projects listed below. The committee will be established within 60 days of the date when the results of the election appear in the minutes of the Board of Trustees. Government Code Accountability Requirements. As required by Section 53410 of the Government Code, (1) the specific purpose of the bonds is set forth in this Full Text of the Measure, (2) the proceeds from the sale of the bonds will be used only for the purposes specified in this measure, and not for any other purpose, (3) the proceeds of the bonds, when and if issued, will be deposited into a building fund to be held by the Los Angeles County Treasurer, as required by the California Education Code, and (4) the Superintendent of the District shall cause an annual report to be filed with the Board of Trustees of the District not later than January 1 of each year, which report shall contain pertinent information regarding the amount of funds collected and expended, as well as the status of the projects listed in this measure, as required by Sections 53410 and 53411 of the Government Code. This measure authorizes the issuance of general obligation bonds to finance the types of projects set forth on the Bond Project List set forth below, to be repaid by tax collections for the years that bonds are outstanding. The measure presented to District voters on the ballot, as set forth above under the heading "INTRODUCTION", includes information regarding the expected approximate amount of money to be raised annually to pay issued bonds, the estimated rate of the approved tax per $100,000 of assessed valuation, and the year through which it is approximated that the proposed tax will be levied and collected. Each of these estimates and approximations are provided as informational only. Such amounts are estimates only, and are not maximum amounts or limitations on the terms of the bonds or the tax rate or duration supporting repayment of bonds. The approximations and estimates provided depend on numerous variables A-2 8 which are subject to variation and change over the term of the District's overall facilities and bond financing plan, including but not limited to the amount of bonds issued and outstanding at any one time, the interest rates applicable to issued bonds, market conditions at the time of sale of the bonds, when bonds mature, the timing of project needs and changes in assessed valuations in the District. As such, while such estimates and approximations have been provided based on information currently available to the District and its current expectations, such estimates and approximations are not limitations and are not binding upon the District. An election will be held in the Acton-Agua Dulce Unified School District (the District") on November 6, 2018 to authorize the sale of up to $7,500,000 in general obligation bonds of the District to finance school facilities as described in the measure. If such bonds are authorized and sold, principal and interest on the bonds will be payable only from the proceeds of ad valorem tax levies made upon the taxable property in the District. The following information is submitted in compliance with Sections 9400-9404 of the Elections Code of the State of California. Such information is based upon the best estimates and projections presently available from official sources, upon experience within the District, and other demonstrable factors. 1. The best estimate of the average annual tax rate that would be required to fund this bond issue over the entire duration of the bond debt service, based on estimated assessed valuations available at the time of filing of this statement, is (1.47 cents per $100) $14.70 per $100,000 of assessed valuation. The final fiscal year in which it is anticipated that the tax will be collected is 2048-49. 2. The best estimate of the highest tax rate that would be required to fund this bond issue, based on estimated assessed valuations available at the time of filing this statement, is (1.47 cents per $100) $14.70 per $100,000 of assessed valuation. This rate is projected to apply in each fiscal year that the bonds are outstanding. It is estimated that such rate would be levied starting in fiscal year 2019-20 and following. 3. The best estimate of total debt service, including principal and interest, that would be required to be repaid if all the bonds are issued and sold will be approximately $15.7 million. The attention of all voters is directed to the fact that the foregoing information is based upon projections and estimates only, which amounts are not maximum amounts and are not binding upon the District. The actual debt service, tax rates and the years in which they will apply may vary from those used to provide the estimates set forth above, due to factors such as variations in the timing of bond sales, the par amount of bonds sold and market interest rates available at the time of each sale, actual assessed valuations over the term of the bonds, and other factors. The date and amount of bonds sold at any given time will be determined by the District based on the need for project funds and other considerations. The actual interest rates at which the bonds will be sold will depend on conditions in the bond market at the time of sale. Actual future assessed valuations will depend upon the amount and value of taxable property within the District C-1 s 13 as determined by the County Assessor in the annual assessment and the equalization process. Section 2. Call for Election. The Board hereby orders an election and submits to the electors of the District the question of whether general obligation bonds of the District shall be issued and sold in a maximum principal amount of $7,500,000 (the "Bonds") for the purposes described in the ballot measure approved under Section 4 and attached hereto as Appendix A and Appendix B, and paying all costs incident thereto. This Resolution constitutes the order of the District to call such election and shall constitute the "specifications of the election order" pursuant to Education Code Section 5322. Section 8. Statement Regarding State Matching Funds. The District anticipates that matching funds from the State of California, if available, may be required to complete a portion of the projects identified in Appendix A. As required pursuant to Education Code Section 151225, the following statement shall appear on the ballot: "Approval of this measure does not guarantee that the proposed project or projects that are the subject of bonds under this measure will be funded beyond the local revenues generated by this measure. The District's proposal for the project or projects described below may assume the receipt of matching state funds, which, if available, could be subject to appropriation by the Legislature or approval of a statewide bond measure." Section 9. Delivery of this Resolution. The Clerk of the Board is hereby directed to send a copy of this Resolution to (1) the Los Angeles County Superintendent of Schools, (2) the County Registrar, and (3) the Los Angeles County Clerk of the Board of Supervisors. Pursuant to Education Code Section 5322, the Resolution shall be received by the County Registrar no later than 88 days prior to the election date, unless otherwise permitted by law. Pursuant to Section 5303 of the Education Code and Section 10002 of the Elections Code, the Board of Supervisors of the County is requested to permit the County Registrar to render all services specified by Section 10418 of the Elections Code relating to the election, for which services the District agrees to reimburse the County in -3- 4 full upon presentation of a bill from the County, such services to include the publication of a formal Notice of School Bond Election and the mailing of the sample ballot and tax rate statement (described in Section 9401 of the Elections Code). The foregoing Resolution was adopted by the Board of Trustees of the Acton- Agua Dulce Unified School District of Los Angeles County, being the Board authorized by law to make the designations therein contained, by the following vote, on June 28, 2018.